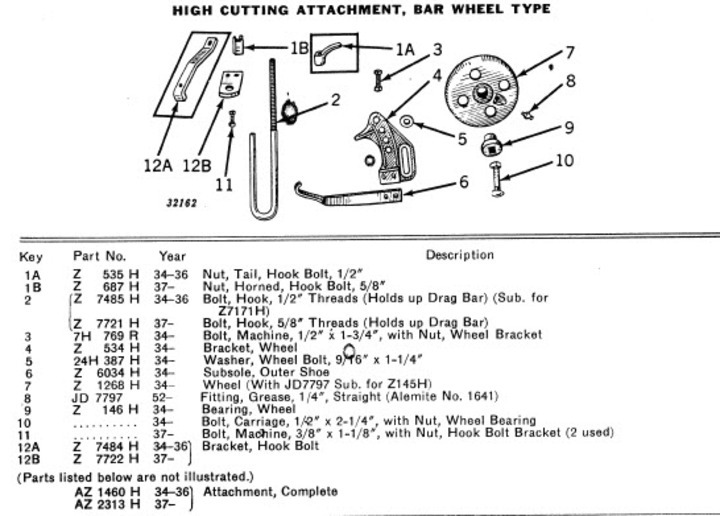 I just bought a John Deere high cutting attachment for my #5 mower (AZ2313), this option allows the cutter bar to be elevated from the ground by a few inches. 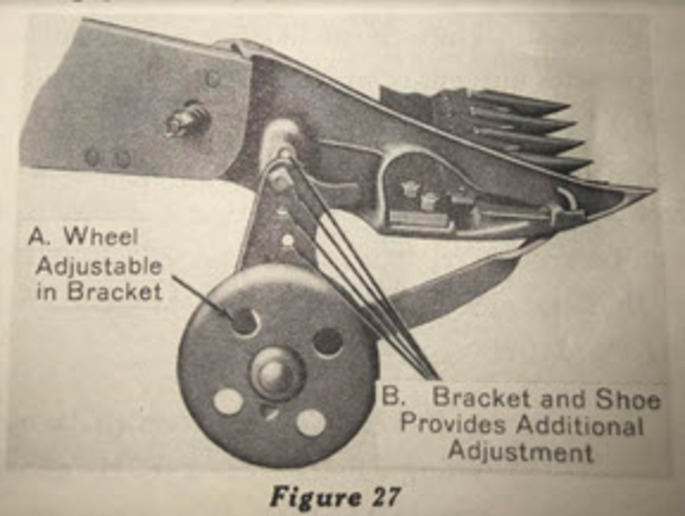 From the JD manual I can see how the wheel assembly attaches to the end of the sickle bar but I am not sure how and where the hook bolt (#2 on parts diagram) attaches on the frame and the drag bar. Does anyone know how this is done, or better yet have a picture? As per the hook bolt, that didn't come with the part I bought off of ebay, but I am thinking I could just fashion one out of some 1/2" or 5/8" threaded bolt stock? Thanks much. Some of the guys in the rocky areas used to weld skids to their bars to raise the cutter bar a couple inches above the rocks.A round rock the size of a golf ball and smaller are the worst.some of our mesa tops are just like gravel pits. Remarked 'water marks' with sod is the worst. the sods get stuck in the gards and leave strips.And more rocks get pulled up as well.Some guys would weld skids on the bar to raise it. I had one of those mowers once. It had 3 skids.About 2" wide.Looked like a mini sled runner. One on each end,and one in the middle.It left about 3" stubble.You could make them as tall or short as you need. Would the j bolt hold the main round shaft that supports the base of sickle, limiting the lowering height of the main skid? Build a skid that would attatched with a longer gard bolt. Then it could be easily removed. I use to run one years back it just clamped to the back of the bar with two allen bolt set screws. used it for several years back in the day.